Los Angeles, CA, Walt Disney Concert Hall - 24 September 2017 7:00 P.M. 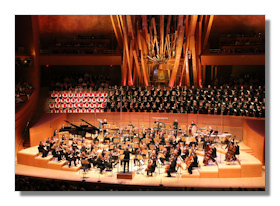 The vibrant and award-winning voices and instrumentation of the Los Angeles Master Chorale, the Los Angeles Children's Chorus, featured world-class soloists and the Los Angeles Master Chorale Orchestra performing Leonard Bernstein's Chichester Psalms and Carl Orff's Carmina Burana ushered in the celebratory start of the 2017/2018 concert season of the Los Angeles Master Chorale. American Classical Music Hall of Fame member and LAMC's Artistic Director Grant Gershon conducted over 100 singers with a full orchestra to a wildly rambunctious triple standing ovation that not only honored Bernstein's centenary but solidified Orff's choral masterpiece as an ebullient high point in the classical repertoire. Chichester Psalms is a musical depiction of Bernstein's wish for brotherhood and peace. It deftly blends two spheres of Hebrew and Christian choral tradition. The LAMC, its orchestra and 13-year old boy soprano Jamie Felix-Toll, showcased the emotional performance piece with exceptional beauty and a sense of prayerful reverence. The piece featured Gershon's flatteringly tailored conducting as well as his signature gestures that sustained the audience's interest and appreciation. The result was an exciting experience in classical music that lead the audience to rethink the mastery of Leonard Bernstein's composition. Twenty-four poems in Carmina Burana were set to music by Carl Orff in 1936. Orff's composition quickly became popular and a staple piece of the classical music repertoire. The opening and closing movement, "O Fortuna", has been excerpted in numerous film scores, advertisements and various popular culture performances to depict ominous or dire predictions, disasters and even satanic, occult and mystical warnings. Its use as a metaphor for these dire circumstances remains undetermined since the Carmina Burana is considered to be the most important collection of Goliard and vagabond songs! The LAMC's performance was a bona fide masterpiece of choral virtuosity. Gershon seamlessly and vibrantly incorporated the various themes and classical music vocabulary into an artfully, crafted and emotionally riveting work. The angelic voices of the LAMC, the virtuosity of the orchestra and the agile bel canto sound of the youthful Los Angeles Children's Chorus and the awesome rich baritone of Stephen Powell, the stunning voice of soprano So Young Park and the playful vocals of American tenor Nicholas Phan, were vocally and instrumentally dynamic all the while striking a balance between innovation and tradition. At the rousing finale, the audience sprang to its feet and applauded vociferously through triple standing ovations as the performers took their well-deserved bows.